There is a healthy population of wolves in Ontario. 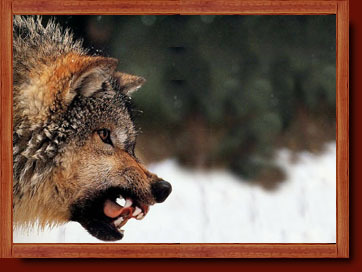 Wolves are an elusive predator and stay away from human populations. Wolf is fast becoming one of the most prestigious big game animals in Ontario. Due to our remote northern location and the vast amounts of wilderness to the north, our bear hunters see wolves at the feeding stations. To harvest a wolf while bear hunting, you need to buy an additional Small Game License and a Wolf Tag.